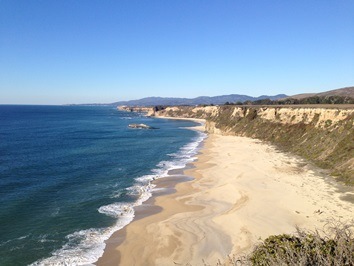 Half Moon Bay, incorporated in 1959, offers a wide variety of public and private attractions. The City rests on the Pacific Coast between forested hills and some of the most beautiful coastlines of California. It is located approximately 28 miles south of San Francisco and lies within the westernmost portion of San Mateo County. The population was 11,324 as of the 2010 census. The historic downtown is home to numerous shops, art galleries, restaurants, bed and breakfasts, and other businesses. Local beaches and parks can be accessed by pedestrians, bicyclists and equestrians. Golf can be enjoyed at two of California’s finest courses next to the Ritz Carlton Resort. The City and Coastside are home to numerous nurseries and farms. The Pumpkin Festival held in October draws hundreds of thousands of people to the coast to enjoy its panoramic vistas, fine cuisine, arts, crafts and genuine hospitality. Mavericks is a famous big-wave surfing location just north of Half Moon Bay and 2 miles from shore outside Pillar Point Harbor. Waves can routinely crest at over 25 feet and top out at over 60 feet. Mavericks is a winter destination for some of the world’s best big wave surfers. A select few big wave surfers are willing to risk the hazardous, sometimes deadly, conditions at Mavericks. Half Moon Bay usually has mild weather throughout the year. Some months there is fog and overcast during the night and morning hours, usually clearing to offshore during the afternoon. January is the coolest month with an average high of 58°F and September is the warmest month with an average high of 70ºF. Temperatures are mild and the valleys are rich. Half Moon Bay and the Coastside are proud of their agriculture and floriculture, where roadside stands sell locally grown fruits and vegetables. Fresh seafood is available in local restaurants or for buying right off the boats in Pillar Point Harbor, to take home and prepare yourself. Residents of the Coastside live a lifestyle that many think no longer exists in California. Neighbors care about each other, schools are important, and there is a sense of real community. The average sales price of Single Family Homes in Half Moon Bay in 2016 was $1,255,140.